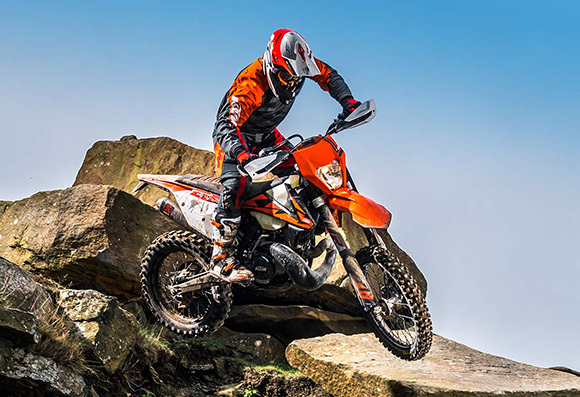 The KTM brand is well-known brand in dirt bike industry and it is providing quality products to its customers. Due to amazing performance and awesome bikes, the KTM brand is included among the list of Best Dirt Bike Brands in the World. 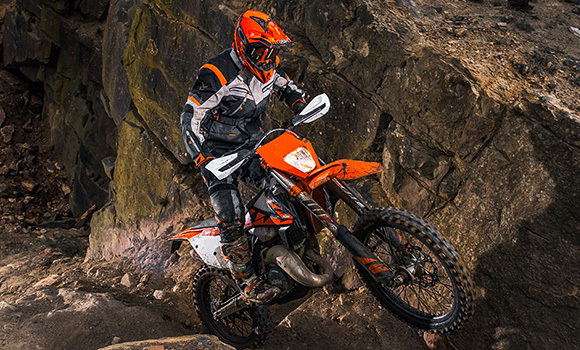 This year it has launched the new 2018 KTM 300 EXC TPI Enduro Dirt Bike that have been optimized to deliver massive amount of power and acceleration. 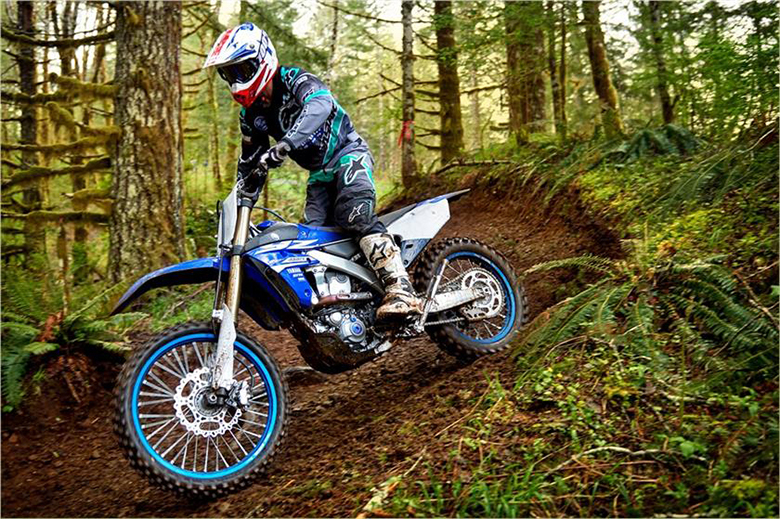 This dirt bike features the 4-stroke 300cc engine that have the ability to deliver an instant response. The extreme level of torque output is one of its best feature. Its lightweight chassis is very attractive and helpful when it comes to tackle obstacles that comes during the ride. Following are the full review, specification and pictures of new 2018 KTM 300 EXC TPI Enduro Dirt Bike. The new 2018 KTM 300 EXC TPI Enduro Dirt Bike features incredible powerful engine featuring an optimal power-to-weight ratio. This engine ensure to have an outstanding performance of all times. 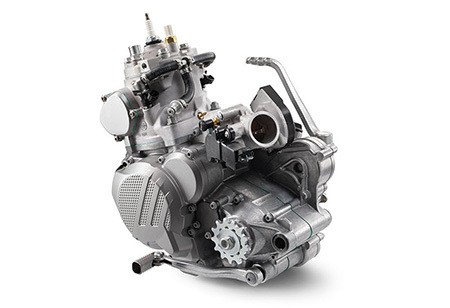 The latest TPI electronic fuel injection is the new benchmark in the dirt bike competition 2-stroke segment. The use of new E-starter, cylinder having two injectors and power valve, six-speed Enduro transmission and latest hydraulically operated DDS clutch. The new cylinders features the bore of 72 mm and it is fitted with the latest power valve, which gives smooth and comfortable power characteristics. The new cylinder contains two lateral domes that hold the fuel injectors supplying the fuel into the rear transfer ports. The downstream injection guarantees to have an excellent atomization of the fuel with the upstreaming air. In this way, the loss of unburnt fuel in minimized for less emissions, efficient combustion and reduced fuel consumption. The little tube in the back of cylinder is linked with an intake pressure sensor, which is responsible to supply pressure data to the control unit. The lightweight die-cast crankcase has been used to achieve optimal mass centralization. This crankcase has the responsibility to hold the clutch shaft and the crankshaft in the high position close to its center of gravity. The new balancer shaft ensure to have amazing handling experience of all times. The new 6-speed Enduro transmission have been used that used the wide-ratio specification that offers easy and precise gear shifting experience. The new No Dirt shift lever design is used that prevents muck from blocking the joint. The new engine management system (EMS) of the TPI models contains the new control unit which is located just below the seat. The control unit determines an ignition timing and the amount of fuel to inject is entirely based on several sensor readings. The cylinder contains the bore of 78mm with the reliable box-type piston made by CP. Its geometry has carefully designed to provide the high-compression combustion chamber 1.2:1 where its robust structure and low weight helps in maximizing its performance. This new engine uses the lateral balancer shaft in order to keep the vibration level to its minimum level. 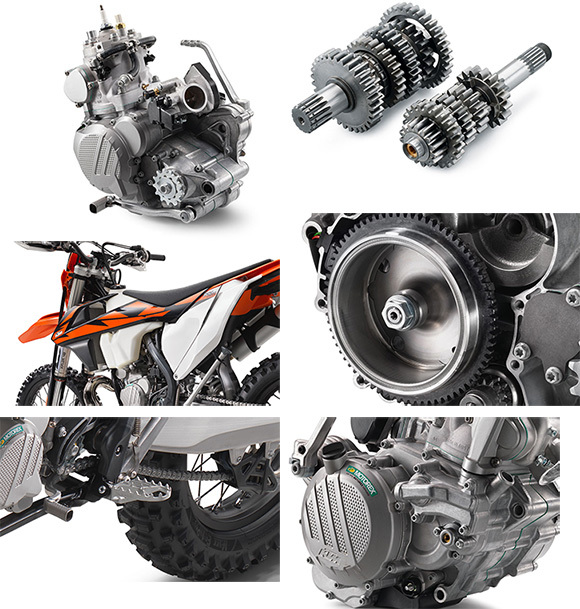 The new 2018 KTM 300 EXC TPI Enduro Dirt Bike comes with the KTM-developed DDS clutch (Damped Diaphragm Steel) having the wear-free steel basket, extremely heat resistant clutch plates, and all-new nitrated steel liners. The clever design contains the new spring instead of usual coil springs making the clutch action easier like in 2018 KTM 300 EXC TPI Six Days. This clever design contains the diaphragm spring instead of usual coil springs making the clutch action easier. The diaphragm spring also provides plenty of space for the damping system to be mounted into the clutch hub. The ultimate goal is to achieve highest level of traction and durability. The lighter operation and telepathic amount of controls comes as standard with the hydraulic Brembo actuated clutch. There is an electronic oil pump, which is responsible to send the oil from oil tank via the throttle body into the engine intake ensuring the perfect fuel-oil mix under all conditions. The throttle position sensor is responsible to reduce the smoke up to 50 percent form exhaust system. The oil capacity is about 0.7 liters, which is considered enough for 5-6 refills of fuel providing more ride to ride. The TPI engine is attached with the newly developed throttle bodies, which are made by Dell;Orto. It contains the diameter of about 39mm. 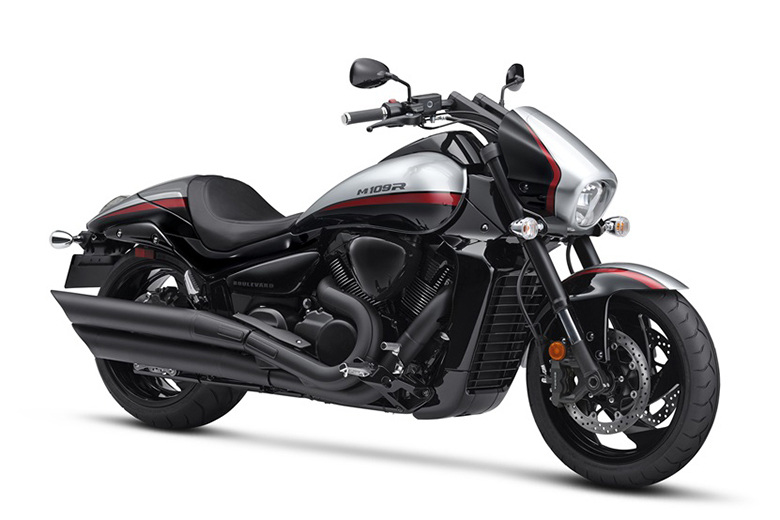 The new airflow is regulated by the butterfly linked with the twin-cable throttle cam, which is entirely operated by the new handlebar throttle assembly. The throttle position sensor offers an airflow data to the control unit that bypass the screw allowing the regulation of the idle speed. 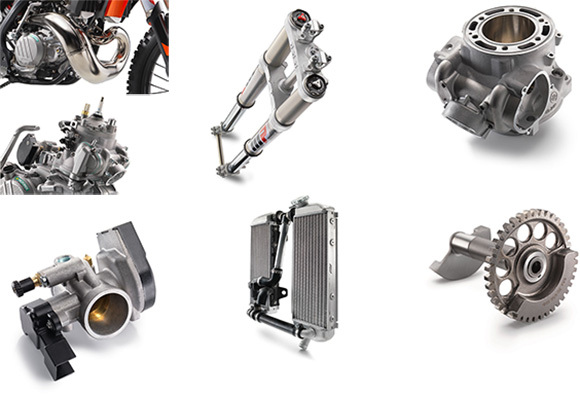 The KTM’s proven cooling system routes the coolant from the cylinder head through the frame triangle directly to an aluminum radiator made by WP. The additional KTM power parts radiator fan, which riders can add to the fuel injected 2-stroke is now controlled by the control unit. This system is very efficient due to the flow optimized internal circulation and CFD-calculated ventilation. The new radiator protections improves the heat dissipation. The new nickel-plated pipe is produced by WP performance system which is taken over form the carburetor model and it is designed for an optimal power band and maximal performance. The modern 3D production process ensure to have top precision and reliability of the pipe. The new 2018 KTM 300 EXC TPI Enduro Dirt Bike features the latest KTM engineered low weight chassis, which is slimmest and lightest dirt bike in the world. 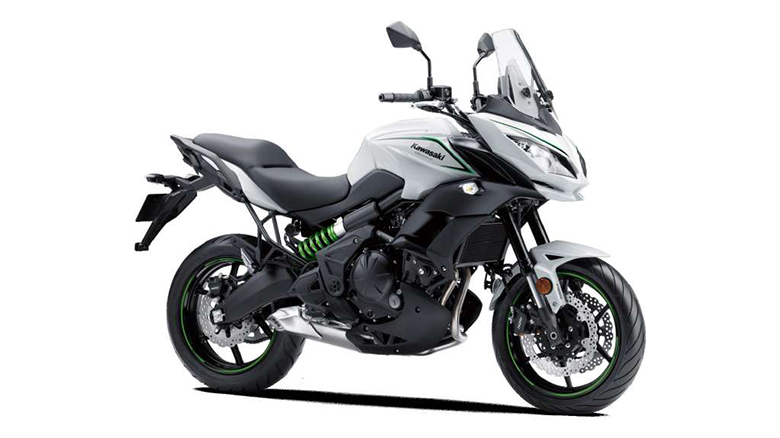 The new high-tech lightweight chrome-moly steel frame features the knack that helps in easy handling, precise cornering, and excellent stability. 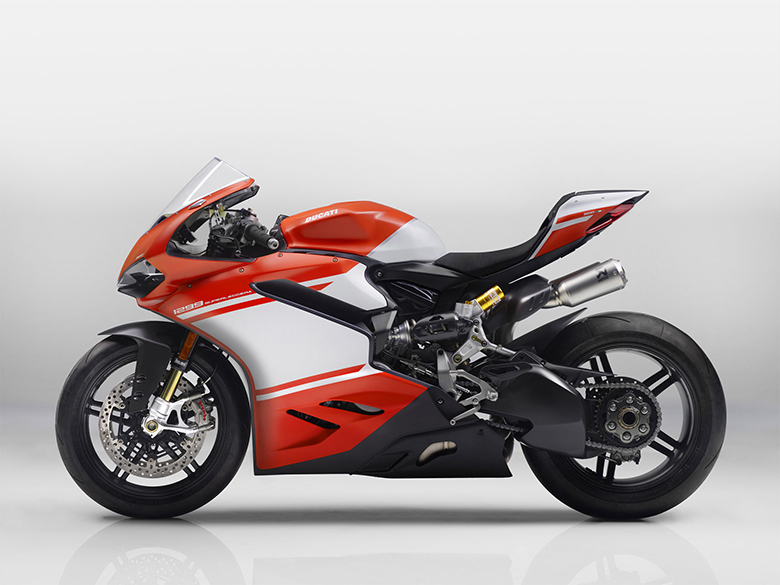 The rider can now feel the torsional rigidity and low longitudinal stiffness, which results in greater absorption of the energy created from its suspension system. In other words, it ensures to have more comfort and less rider fatigue. The lightweight engine head has been laterally attached and they contribute to achieving the minimum vibration level. The new two threaded inserts in the lower cradle tubes let the rider for safe fixation for an optional skid plate. The frame is about kilogram lighter than the lightest competitor on the market plus its maintenance is very easy. On the EXI TPI models, the upper frame tubes contain the slot where the oil filler cap is attached that feeds the oil tank via the hose inside the frame tube. This dirt bike also has an extra-light sub-frame which is made up of a stable aluminum profile, which reduces the scale at less than 900g like in 2018 KTM 250 EXC TPI. The new cast aluminum design provides the low weight and great flex behavior. The solo-component casting process reduces all the weak points that might be created by welding. 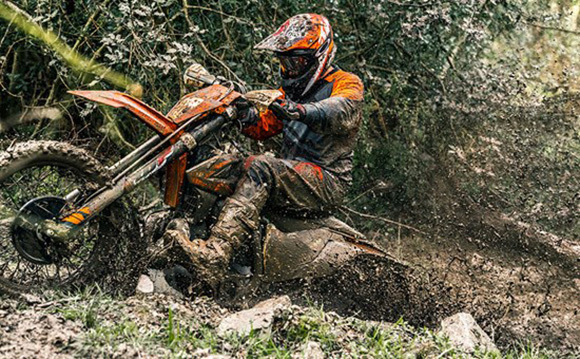 The new 2018 KTM 300 EXC TPI Enduro Dirt Bike features the EXC wheels that contains the lightweight CNC machined hubs and high-end Giant rims that ensure to have maximum stability at minimum weight. The wheels are fitted with the Maxxis tires that guarantee to have maximum stability and grip on all kinds of surfaces. The latest WP XPlor 48 upside-down fork is the split fork that has been developed by WP in close collaboration with KTM. It is attached with the spring on both sides but contains separated functions for each fork leg. Due to the high-quality materials and the state-of-the-art production process, the new WP XPlor 48 fork contains the travel of 300 mm. It offers an outstanding response and damping characteristics. The comfortable preload adjuster can be retrofitted and lets the simple spring preload setting in just three steps without tools. 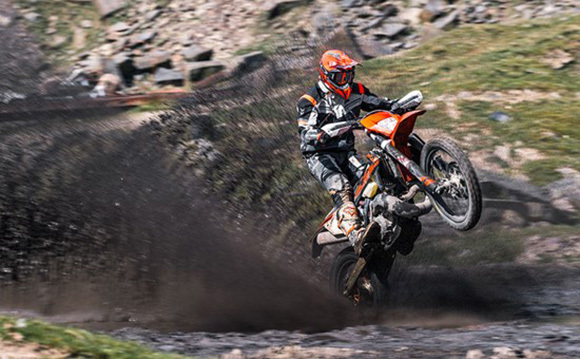 The PDS is the kind of KTM trademark where the shock absorber is directly connected to the upper side on the swingarm. This setup boasts the best possible geometry and offers best progressive damping. 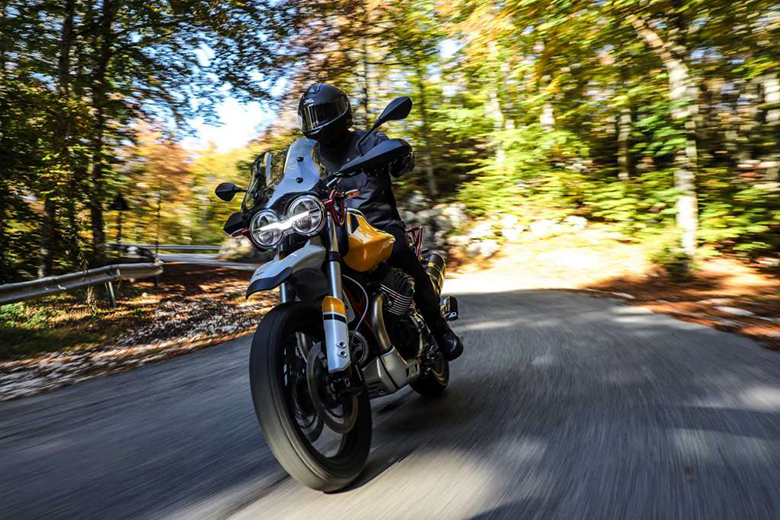 The shock absorber is linked closure to the centerline, which simply means that almost symmetrical loads for swingarm and frame and more space for an exhaust system. The second piston works together with the closed cup with the end of the stroke and it is supported by the progressive shock spring for better resistance. The latest forged triple clamps are attached with the offset of 22mm that guarantee to have a solid grip of the fork and to have a precise handling. Its handlebar is entirely adjustable forwards and backward over 4 different positions, so the EXC TPI will fit in the rider’s gloves. 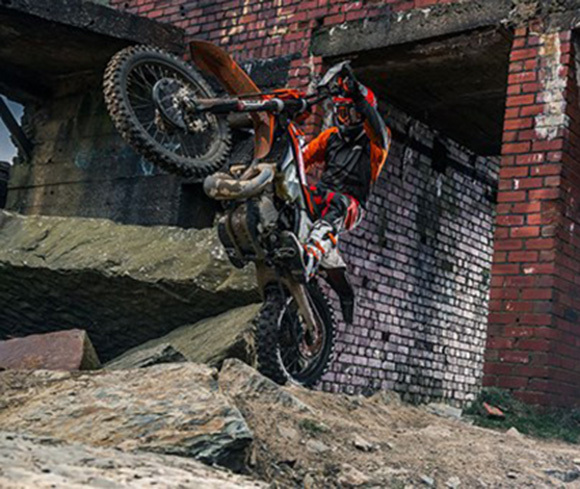 The new 2018 KTM 300 EXC TPI Enduro Dirt Bike features the high-tech Brembo babies are combined with the lightweight Wave brake discs. These brakes are faster, better, stronger and harder. The newly launched 2018 KTM 300 EXC TPI Enduro Dirt Bike features the lightweight polyethylene tank having the capacity of 9.25 liters. 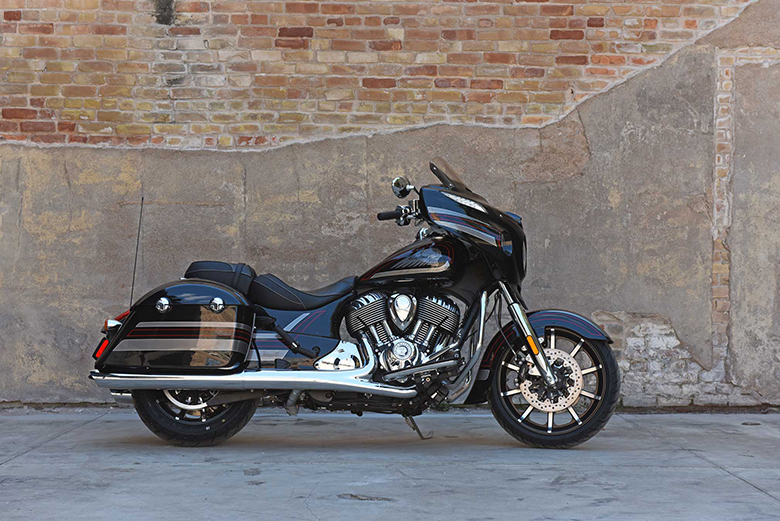 The new EXI TPI models have the ability to incorporate the new integrated fuel pump system and an additional fuel level sensor so that rider can easily know when he is running low on gas. The new air filter box design provides maximum protection of the air filter against soiling while it also ensures to have maximum airflow. The EXI TPI models use the new intake snorkel, which has been designed for the new throttle bodies while also hosting an air temperature sensor. The large Twin Air filter is attached to the stiff cage, which holds the system in place. This design is so simple that one can easily pop a fresh one in with the face full of mud without any need of tools. 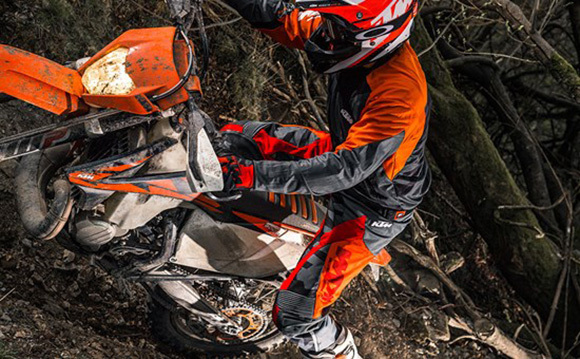 The newly launched 2018 KTM 300 EXC TPI Enduro Dirt Bike features an incredible ergonomics that help in an ideal ride. 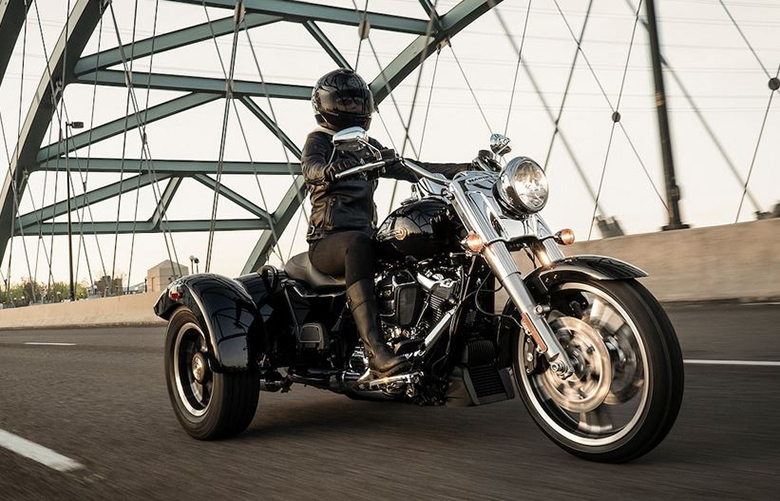 The new handlebars provide maximum control over the rider’s hand. These handlebars are tapered and made up of strong aluminum by NEKEN containing the best throttle assembly. The vulcanized grip is fixed on the right side on handlebars while the left side contains the ODI lock-on grip. The new footpegs have been used that prevent the dirt from smudging up the pegs. The pegs on the Enduro models have 6 mm higher than the one used on the SX models. The new 2018 KTM 300 EXC TPI Enduro Dirt Bike features an impressive KISKA design with the goal to establish the complete harmony between the riders and bike. The perfect ergonomics and contact points offer maximum comfort in the movement on the EXC TPI. The latest I-beam structure of the front and rear fender ensure to have maximum stability and low weight. 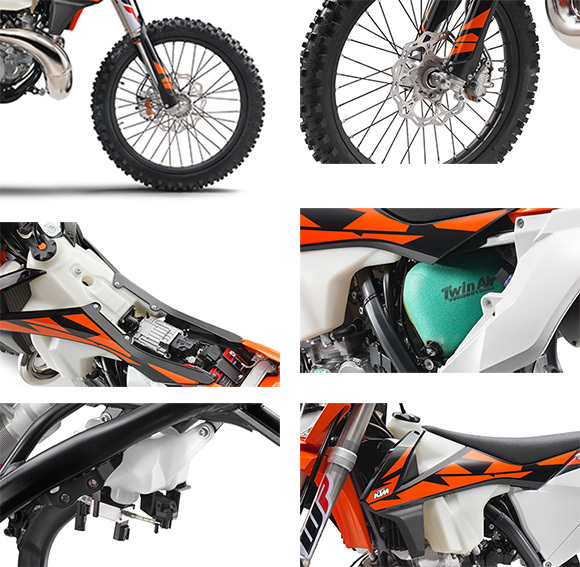 The new graphics of 2018 KTM 300 EXC TPI Enduro Dirt Bike ensure to have an attractive graphics of all times. The new 2018 KTM 300 EXC TPI Enduro Dirt Bike features the latest technology of all times. It comes with the lightweight but strong lithium-ion battery. The battery and wiring harness are centralized in the compartment just above the air filter box that allows the mechanic to remove the sub-frame without getting into an electronics. The new TPI models are being attached to the stronger generator that has the ability to deliver 196 W of power. This article is about the review of new 2018 KTM 300 EXC TPI Enduro Dirt Bike and it is covered under www.bikescatalog.com. 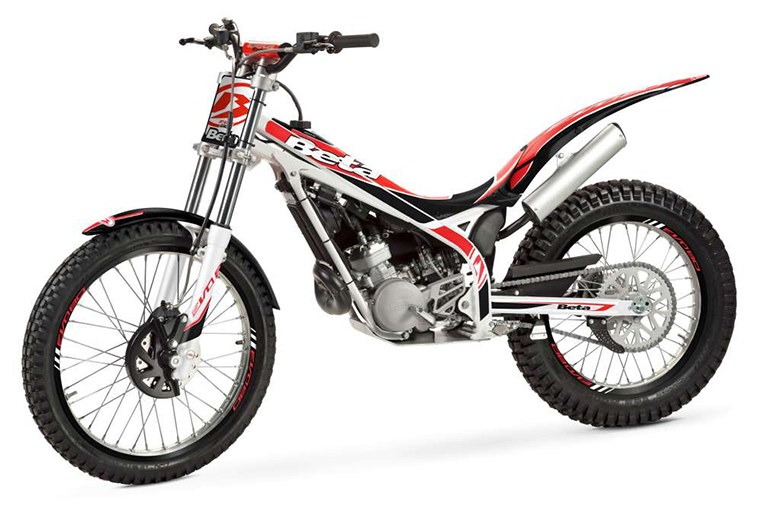 This bike is really an ideal for those who have a great craze of dirt bike riding. It contains the powerful engine that has the ability to provide an incredible performance under all conditions. Each and every part of this bike has been carefully designed to achieve outstanding ride-ability, maneuverability and thrill ride.